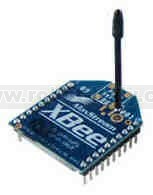 The XBee OEM RF module is a ZigBee/IEEE 802.15.4 compliant solution that satisfies the unique needs of low-cost, low-power wireless sensor networks. 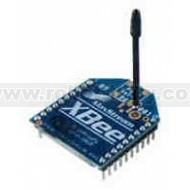 The XBee OEM RF module is a ZigBee/IEEE 802.15.4 compliant solution that satisfies the unique needs of low-cost, low-power wireless sensor networks. The modules are easy-to-use, require minimal power and provide reliable delivery of critical data between devices. Its small form factor saves valuable board space. The XBee module operates within the ISM 2.4 GHz frequency band and is pin-for-pin compatible with MaxStream's XBee-PRO (60 mW) Zigbee Module. The modules are optimized for use in US, Canada, Australia, Israel and Europe. No configuration is necessary for out-of-box RF communications. The module?s default configuration supports a wide range of data system applications. Advanced configurations can be implemented using simple AT commands. ZigBee is a wireless technology developed as an open global standard to address the unique needs of low-cost, low-power, wireless sensor networks. The standard takes full advantage of the IEEE 802.15.4 physical radio specification and operates in unlicensed bands worldwide at the following frequencies: 2.400?2.484 GHz, 902-928 MHz and 868.0?868.6 MHz. The 802.15.4 specification was developed at the Institute of Electrical and Electronics Engineers (IEEE). The specification is a packet-based radio protocol that meets the needs of low-cost, battery-operated devices. The protocol allows devices to intercommunicate and be powered by batteries that last years instead of hours. The ZigBee protocol carries all the benefits of the 802.15.4 protocol with added networking functionality.